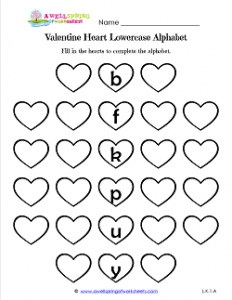 On this Valentine heart worksheet kids fill in the missing letters. It may be a bit tricky. The letters that are provided go straight up and down right through the middle of the page. Remind kids to fill in the letters just as they would if they were reading – from left to right and top to bottom. When they’re done filling all the letters they should read the letters out loud to see if they sound like they’re in the right order. If not, they can simply erase and write in the new letter. Kids can also outline or color in the hearts in a pattern.